If you are a lover of high impact interiors, then you need to look at colour schemes that add drama. By clashing contrasting colours you quickly create that high-energy appeal that I really love. 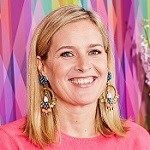 Sophie Robinson is the darling of the interiors world – loved for her colourful interiors, crafting know-how and quirky sense of style. We always enjoy a natter with Sophie, and here she shares the inspiration behind her Colour Clash design for us, along with a few styling nuggets that we can’t wait to try out for ourselves. Sophie, are you pleased with how the Colour Clash roomset has turned out? I’m a self-confessed colour lover, cushion hugger and pattern clasher, so this room ticks all three boxes. I love the way the colours play off one another. You have the rather frivolous pink next to a serious navy and then that cheeky pop of yellow is just perfection! Can you tell us more about the design process behind your roomset? I started by choosing the fabrics for the windows. These colours then dictated the wall colours and colour scheme for the furnishings. I then added the vibrant yellow to stop it all looking too matchy-matchy. I like to ‘kick it off’ a bit to keep things looking interesting. I like interior design to have fun so I’m enjoying the way the patterns play off one another. I love an interior space to feel like a home and reflect the individuals’ taste and story. For me an eclectic mix of styles really helps create an organic feel. I like a room to look like pieces have been added and curated over time. A gallery wall is a real favourite styling trick of mine. I love the fluidity it offers – like you could add and subtract the pictures to create new interest or tell a different story over time. Tell us more about the products you chose for your scheme? I chose to combine Roman blinds and curtains, as I love the way they make a room feel cosy and furnished. It also gave me an irresistible opportunity to clash two fabric patterns against one another. What are your top tips for styling a window? If you have a small space, consider just having a Roman blind. Short curtains only ever work in cute country cottages. If you have the radiator under the window, consider a Roman blind combined with floor length curtains that are just for show in winter. As a lover of colour, are there any colours you would never use in a design scheme? Black and white. In their purest form, they are too hard and harsh to live with comfortably. What one tip would you give to anyone designing a look for their new home? Invest in the basics like quality big furniture items, flooring and lighting. Then scrimp on the accessories by shopping at discounts stores and car boot sales. You can easily collect nicer pieces as you move along. Have you ever had a window dressing disaster? On a recent episode of DIYSOS the curtains company sent short curtains instead of floor length. I had the TV runner driving all around West Sussex looking for the full-length version in time for the reveal. That’s how strongly I feel about short curtains! Interior stylist Daniela Tasca York shows you how to create a Minimal Luxe interior using fabrics from the new collection of curtains and Roman blinds. Interior stylist Emily Henson shows you how to create a Modern Rustic interior using fabrics from the new collection of curtains and Roman blinds. Interiors journalist Kate Watson-Smyth shows you how to style an Urban Glamour interior using fabrics from the new collection of curtains and Roman blinds.